I heard about Anderson Ranch 3 years ago while I was at Penland School of Arts and Crafts. Penland became a starting point for me where I decided from then on every year I would do something special for my personal growth. 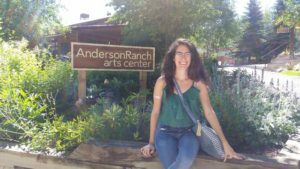 Going to Anderson Ranch was actually more of an accident than a conscious effort. All I knew for this year was that I was going somewhere, I wasn’t exactly sure where, just somewhere. So I started applying for scholarships at both Penland and the Ranch for the summer. I barely made the deadline for the Ranch, and it wasn’t until two months later that I called and found out I had won a full tuition scholarship. The scholarship funded through the FSU Department of Art was also unexpected. Once I had heard about it, I filled in the paperwork and crossed my fingers that I would get something. And, I did. I got into a painting workshop titled “Problem Seeking: Chasing the Quixotic/Impossible Image/Object” by Karl Burkheimer. All I knew about the workshop was that we would be practicing creative thinking and making. My best guess was that there would be some sort of painting involved, but I wasn’t really sure. Of course the class turned out to be incredible, and so did the Ranch. It turned out to be a seminar in which we would meet at a table and discuss for several hours what creativity is, systems and strategies for making, and ways in which to make it a game. After all, art making is a game. It’s a game in which we set a question and the parameters in which to seek and answer that question. The course was much more exhausting than I had anticipated, and it fueled our entire class to make. We were given small tasks, what Karl Burkheimer would call “challenges.” He never liked naming our tasks “assignments” or “tasks,” he said such language would limit what we woul d produce or how we would think of our “challenges.” The entire class was geared to making the “not ta-da.” In other words, we were encouraged to make work that we had no vision for, we were encouraged to make the non spectacular, therefore the unpredictable. For many of us this was difficult, especially since we’ve been conditioned to make the beautiful in order to seek recognition and acceptance. But in this class, anything went. It didn’t matter if it was collecting flowers or piling dirt on wood and spray painting it, what mattered was letting it out. Once it was out, we could truly observe and learn.